Rubber moldings include seals, gaskets and other custom molded rubber products made from elastomers that provide high durability and elasticity. Precision molded rubber products are ideal for indoor and outdoor sealing because they can withstand a wide temperature range and return to their original shape after being distorted. If you need high quality, custom molded rubber products, look no further than Northwest Rubber Extruders. We have molding rubber capabilities that allow us to create precision molded rubber products in simple or complex geometries. Lean manufacturing processes enable us to deliver custom parts in some of the industry’s fastest turnaround times. Northwest Rubber Extruders produces custom molded rubber products through a variety of processes, including compression, injection, transfer, and fabric-reinforced molding, as well as rubber-to-metal bonding. We can custom-mold numerous materials, from natural rubber and chloroprene/Neoprene® to phenyl silicone, fluorocarbons, and many others. Our molding rubber capabilities include a wide range of custom molded rubber products–aircraft gaskets, bellows, grommets, window seals, and much more–in short runs or in quantities in the tens of thousands, all with the highest level of quality and accuracy. Request a quote for the molded rubber products you need, or contact Northwest Rubber Extruders to learn more about our custom rubber moldings and rubber extrusions. 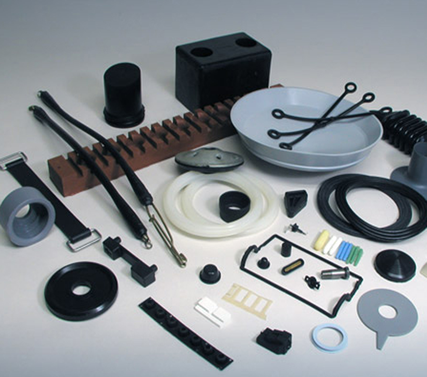 Industrial molded rubber products are creating using various processes and a wide range of rubber materials. Northwest Rubber Extruders has the expertise to help you select which process and material is best for your custom molded rubber product application. Our molding line can accommodate molds up to 32 inches square, giving you a full range of versatility in the creation of your custom molded rubber products. During this molding rubber process, raw rubber materials or compounds, known as pre-forms, are placed into molds that have a top plate and bottom plate. As the plates are pressed together, the rubber fills the mold cavity with excess flowing into overflow grooves. Once the molding process is complete the rubber moldings are taken out of the mold and the excess flash is removed. Injection molding is a process where heated rubber is injected into a mold containing a series of cavities. The process reduces the need for pre-formed rubber and therefore, has a reduced cycle time. It is also ideal for more complex designs because the heated material flows easily into the cavities. The transfer molding rubber process is similar to compression molding in that pre-forms are used instead of heated rubber. There are, however, some differences in the two processes. During transfer molding, the pre-forms are placed into a top portion of the mold known at the pot. As the mold closes, the rubber is compressed and forced through a sprue and into the mold. Once formed, the custom molded rubber products are deflashed and the excess rubber is discarded. Our standard molding rubber processes can be further customized to create rubber moldings designed for high demand applications. This method of molding involves adding a layer of fabric to the rubber moldings to increase durability and longevity. The fabric is layered into the mold first, then rubber is compressed into the mold to bond the two materials. Fabric reinforced custom molded rubber products feature higher tensile strength and abrasion resistance than standard rubber moldings, making them ideal for aerospace and other demanding applications. Rubber-to-metal bonding is a molding rubber process where rubber is bonded onto a metal insert. To form the bond, the metal inserts are coated in adhesive and then placed into a mold. After the mold closes, heated rubber flows around the metal insert and attaches to the adhesive. The rubber-to-metal molding process is used for applications requiring both flexibility and stability and can be used for both large and small components. View our Elastomeric Material Selection Guide to learn more about the advantages and disadvantages of each rubber molding material and how determine which would perform best in your intended application. Contact us to learn more about custom molded rubber products created using a range of processes and materials or request a quote. We also provide value added services including hand building, part marking, deflashing, assembly, and more.